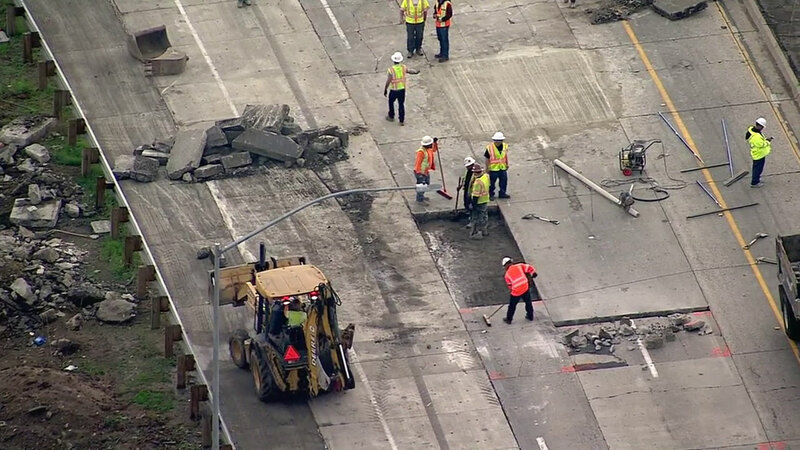 COMMERCE, Calif. (KABC) -- Cracked and lifted concrete slabs damaged by Thursday's wet weather prompted an emergency closure of the northbound 710 Freeway near the 5 Freeway in Commerce. The closure happened around 1:45 p.m. after crews noticed the slabs had large cracks and were coming off the ground, which could become a danger to drivers. Three slabs were replaced, but workers were evaluating others that may need to be changed. On Wednesday, Caltrans employees noticed some slabs had cracks, but left it as is because of the oncoming rain storm. But the wet weather heavily damaged the slabs, causing the sudden closure. The freeway was reopened around 5:30 p.m.